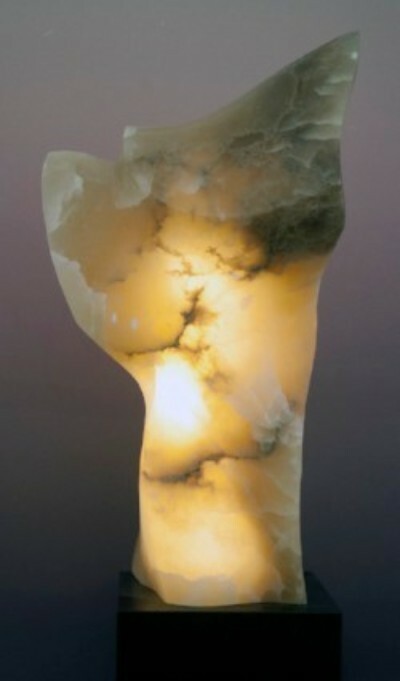 The translucent quality of alabaster lends an additional beauty to this stone. My fascination with incorporating light, both reflective and artificial into my works, brought me to a place in my sculpting career that made alabaster seem to be the material of choice for my next piece. As I began to carve, my excitement grew as I noticed what appeared to me as “internal veins”. My thoughts then began to guide my chisel toward the anatomical design I have captured here…an abstract, yet very identifiable “Torso”. “Let me introduce light from within” was my next thought. So I began to hollow out my design in order for the finished work to have space within to receive an internal light source. White neon was my choice. The finished work is an exciting combination of the beauty of ancient alabaster incorporated with the very contemporary illumination of neon from within. I hope you enjoy “Torso” as much as I did creating it!.